The Ladner Branch of the Royal Canadian Legion was chartered on March 21, 1928 and was originally known as the Canadian Legion of the British Empire Service League. In 1960 the Legion was renamed the Royal Canadian Legion. The original building was deeded to the Branch in 1945 by the Municipality of Delta and was located where the Ladner Community Centre is situated now. At that time the building housed the ‘Dugout,’ a servicemen’ s canteen which had been established for the benefit of members of the armed forces stationed in the area. When it finally closed it’s doors, an estimated 50,000 armed forces personnel had passed through those portals. Also, about this time a bowling alley was purchased and moved to a building which had been erected adjoining the high school. The Branch’s main form of income was from this bowling alley. 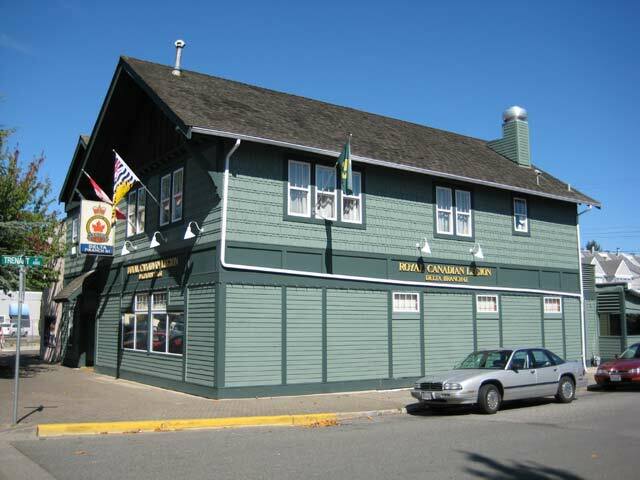 In the 1950’s, the Branch received its liquor license and was moved to the foot of Delta Street in the heart of Ladner Village. 1970 brought about a third move to the current location on Delta Street. Branch 61 is the third owner of this building, constructed in 1922 for the Bank of Montreal and later went on to become the BC Government Liquor Store. Branch 61 obtained the King George V High School buildings in 1945, and it was shared with the library, a hall and youth groups. 1950 saw a move to a new building at the foot of Delta Street. Pictured is the building in use by the“Delta Municipal Police,” circa 1964. The present buildings on Delta Street were secured in 1970. Extensive renovations have made this historic building an excellent venue. The Legion provides bursaries to local scholars, supports senior and minor sports teams, the cadets and other youth groups. We work together with other local groups to supply Christmas hampers for the needy in our communities. We also participate in many other community endeavors. If you need assistance in any way please do not hesitate to contact our branch Service Officer. If you are a Veteran, or a member of Branch 61, you may be eligible for medical aids. The Ladies Auxiliary in Ladner was started in 1944 by dedicated wives of our soldiers both here at home & overseas. As the years have progressed they have put on dinners, dances, raffles, raising monies for many charities. Remembrance is the cornerstone of The Royal Canadian Legion’s (RCL) work in Canada. The Poppy Campaign is a major source of funds used to assist veterans, ex-service people & their dependents. Members and bona fide guests are always welcome. There’s something for everyone. Dance the night away with our live bands every Friday and Saturday night – from good old country and classic rock ‘n roll to 70’s, 80’s, 90’s and Contemporary tunes. Music starts at 8:30 p.m.
We keep well maintained equipment in our billiards room — socialize over a game. Pool is free every Monday through Thursday. Mondays at 7 PM we have “drop in DARTS” every one is welcome, and during the week casual games take place when the dance floor is not in use.